One of my goals for working with educators around the Common Core is to showcase how technology and media also fit into ways that we can engage our students as composers and creators. During two full-day sessions this week, I led a group of teachers not only through the layers of Common Core in our state, but also through various technology tools that were part of the learning. In other words, I tried to embed the technology as much as possible, and then made that embedding visible, so that teachers might see some possibilities for doing the same in their classroom. Feedback at the end of our two days together indicated an appreciation of deeper understanding of the Common Core standards, but also an appreciation of how technology was used in meaningful ways as part of the learning. As I told them, I hoped I was planting some seeds for them for the future, and that by using the technology themselves for learning, they might transfer that to their students. 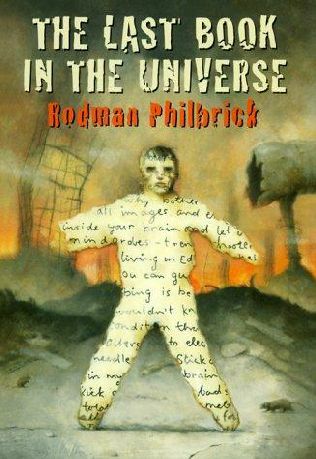 It seems odd to admit it, but I didn’t realize that Rodman Philbrick’s novel, The Last Book in the Universe, would be a dystopian book. Well, duh. It was the title that caught my eye, and also, I have enjoyed various Philbrick novels this year (our summer reading is The Mostly True Adventures of Homer P. Figg). But I wondered what book would be the last book? Set in a future after “the big shake” has decimated just about everything and everyone, society is splintered in a few protected areas, surrounding what is known as Eden, the home of genetically perfected society of people known as “proovs.” Yes, biblical and literary allegory looms large here. The main character is Spaz, and the plot revolves around his adventure is to get back home to his foster sister, who is dying of leukemia. Spaz, who is an epileptic, is joined by an old man, Ryter (say that one out loud), and a young boy who remains mostly nameless. Ryter has been writing a book, which is an unknown and forgotten art form, and he joins with Spaz to capture one last adventure (like Odysseus, he notes, to which Spaz asks, who?) before he dies. Like Anthony Burgess has done in A Clockwork Orange, Philbrick has invented an entire lexicon for this world that has been almost destroyed, and it is survival of the fittest and quickest, and luckiest. And while Philbrick paints a terrible place, he laces his story with hope, and I won’t give away what we understand becomes the “last book” in the universe, except to say that the book has lots of action, thoughtful inquiry into modern day culture, and insights into the unspoken power of capturing our stories in words for the future. In a recent session with educators looking deeper into our state’s Common Core document, we did an activity around the Guiding Principles, which really put the standards in a good perspective. Here, teachers were given one of the ten principles, asked to synthesize the information, and then come up with a key word or phrase. We then used Answer Garden to collect those phrases as a word cloud activity. I just finished up two full days of leading inquiry around the ELA Common Core (as reflected in our new Massachusetts ELA Curriculum) with a great group of elementary teachers. I’ll share out how I embedded a lot of technology sharing into our inquiry study, but I wanted to feature this podcast that we did with Cinch. They had to write (actually, they wrote … a lot) about the potential and the concerns they see with the new curriculum (as well as illustrate their relationship with Common Core in a drawing), and then I asked for volunteers to podcast what they wrote. This all stems from some reading we did in the Pathways to the Common Core book by Lucy Calkins and others (worth the read!). The creator of this video — Frank Romanelli — shared his work in an online inquiry group I am part of. 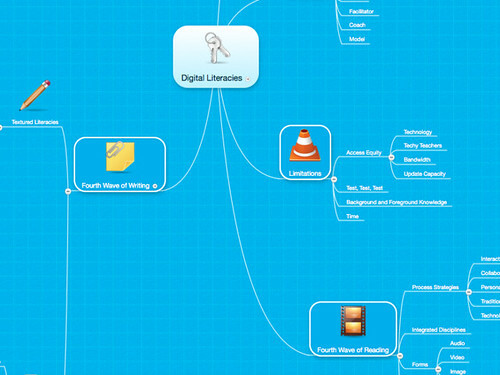 It’s a fantastic and intriguing video — from content to presentation. Notice how the theme is the ever-increasing importance of teachers even as literacy is undergoing change. The power of writing — in whatever form — still remains a powerful force of expression and understanding. I created this Prezi for an inquiry group around the Common Core (ELA), trying to give a sense of the overall structure of the document, the shifts that are taking place, and where we are heading with it. If it helps you frame the Common Core, then feel free to use it. Novelist Linda Sue Park explores the horrific impacts of the war in Sudan by making the experience personal, drawing the reader into the saga of a “lost boy” who was forced in 1985 to abandon his village when war broke out, and then walked first to refugee camps in Ethiopia and then to Kenya, before making his way to the United States. The main character in A Long Walk to Water is Salva Dut, and Park based him on a real person who decided to make an impact on the Sudan by creating a foundation that would provide villages with one thing they desperately need: clean water. Park alternates the story here of Salva’s survival with the life of Nya, who lives in a village in Southern Sudan in 2008 and whose job in her family is to walk across the desert for hours every day to a pond to fetch water. Later in the book, the threads of the stories weave together nicely as the organization that Salva has created (through public speaking before donors and connections to schools and community groups) comes to Nya’s village to dig a well that will change the lives of her, her family and surrounding villages forever. The narrative of the “lost boys” who were forced to walk for months, and sometimes even years, to get away from the violent war zones that overtook much of the Sudan (including Darfur) has been told before (I still hold up Dave Eggers’ What is the What as required reading to my adult friends). But Park’s book is appropriate for middle school students, particularly those who are studying or who have interest in modern-day African politics. (Since the publication of the book, the Sudan has become two countries, splitting down ethnic and political lines that form the backdrop for A Long Walk to Water.) Park does not mince words or minimize the suffering of her characters. But by focusing in on the stories of an 11-year-old boy and young girl whose lives slowly come together, Park astutely balances tragedy and triumph, and focuses in on humanity rising above violence. The inspiration for the book — Salva Dut — created the organization, Water for Sudan , to raise money for wells, and it seems like it continues to do that work. I’m involved in an online inquiry over at P2PU around “Curating our Digital Lives” and we are just now exploring our conceptions of curation. The video is part of what is being shared to get us started as we think about how we collect, organize and share information in digital spaces. I am also adding in the idea of identity, and how identity shifts in digital spaces, and impacts our considerations of curation. The other day, I wrote about discovering an oddly disjointed video game that used the act of writing as part of the game play. It was strange, but fascinating. So, I wondered if I could use the idea of writing for a video game in Gamestar Mechanic. 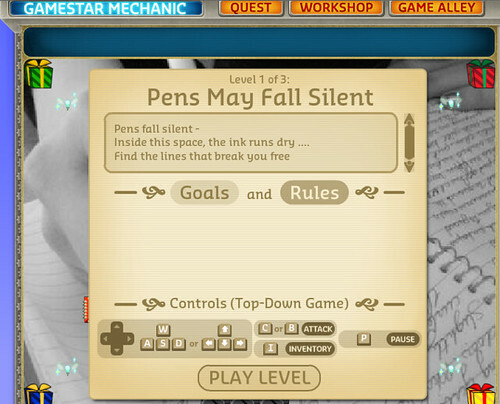 You can play my Writer’s Block game here or in the embedded version below. The tools in Gamestar were fairly restrictive for what I had in mind, and so, the game did not really develop as I envisioned it. Still, I liked the second level the best — where the removal of blocks uncovers texts that make up a poem.